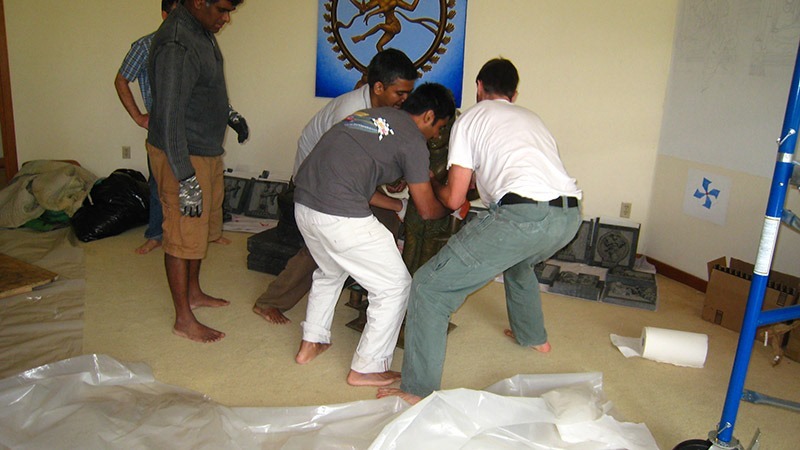 Sri Sadisvara Mandiram (Part 5) Murtis Arrive! August 16 & 17 were very exciting days at the SAT Temple. After 17 months since the conception of the Sri Sadisvara Mandiram, Ganesha, Skanda, Siva Lingam, Sivakami, Nandi, and the tiles depicting Sri Ramana, Adi Sankara, Siva and Ribhu arrive at SAT. 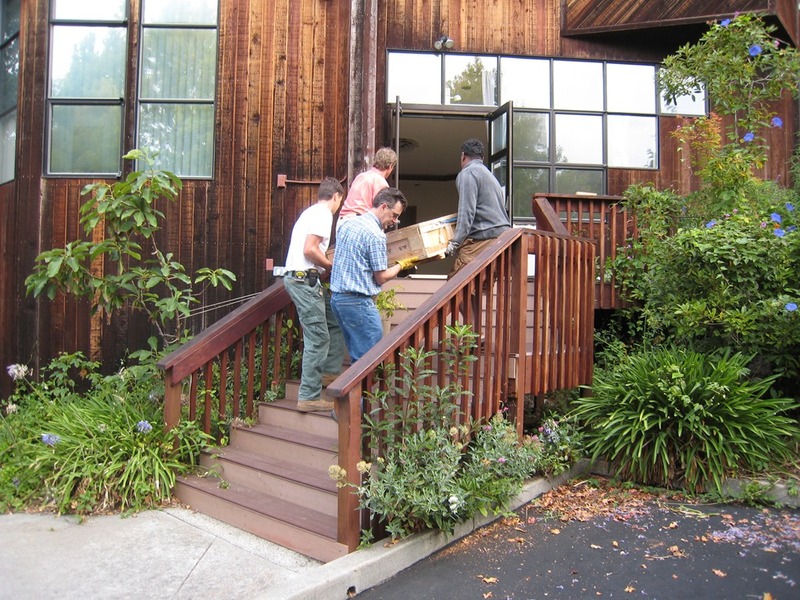 Below are images of their arrival at the SAT Temple. 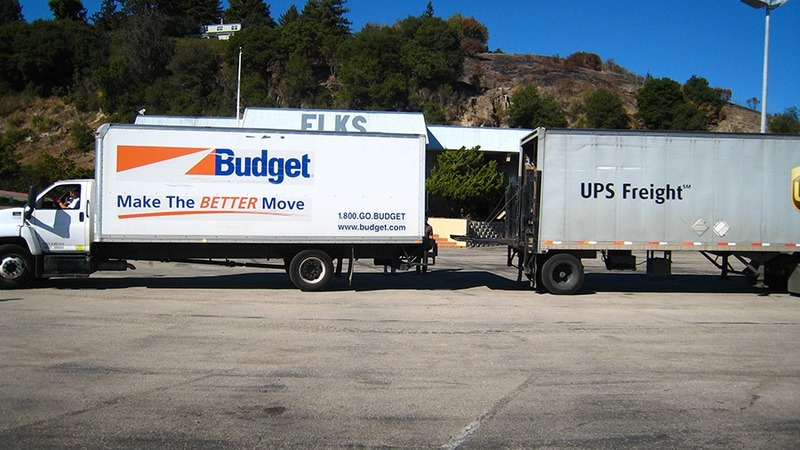 Scott backs a Budget truck to the back side of the UPS truck holding the Murti-s. 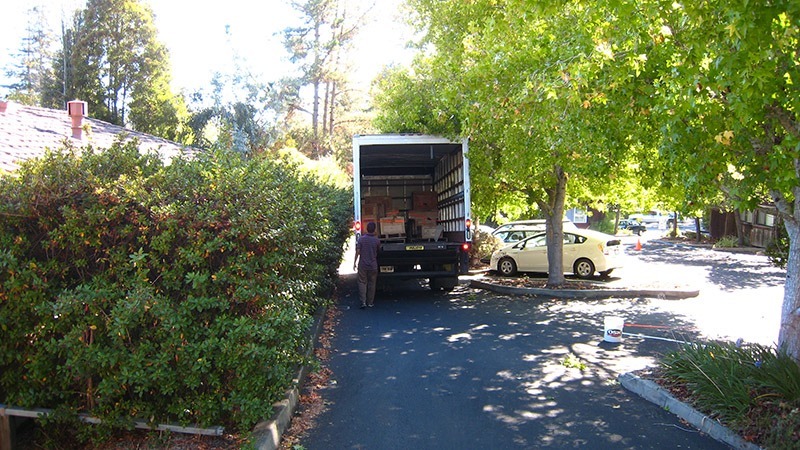 The UPS truck is too large to get into the SAT parking lot so we use our neighbor’s parking lot to do the transfer. 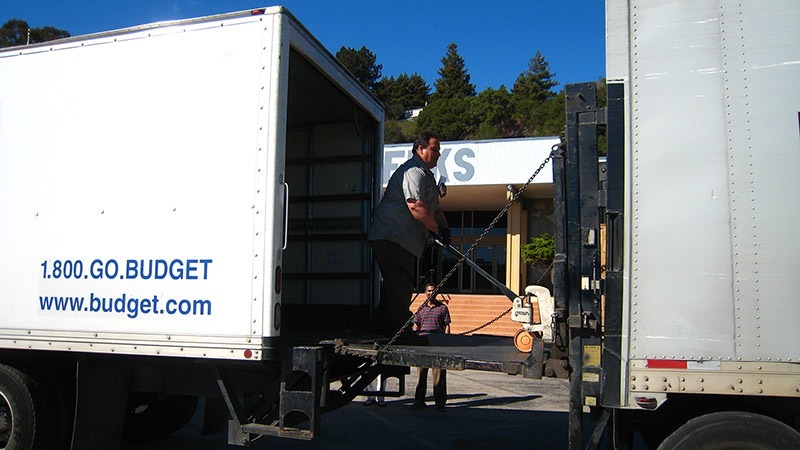 Nome and Raman look on as the trucks align their lift gates. Uh-Oh! 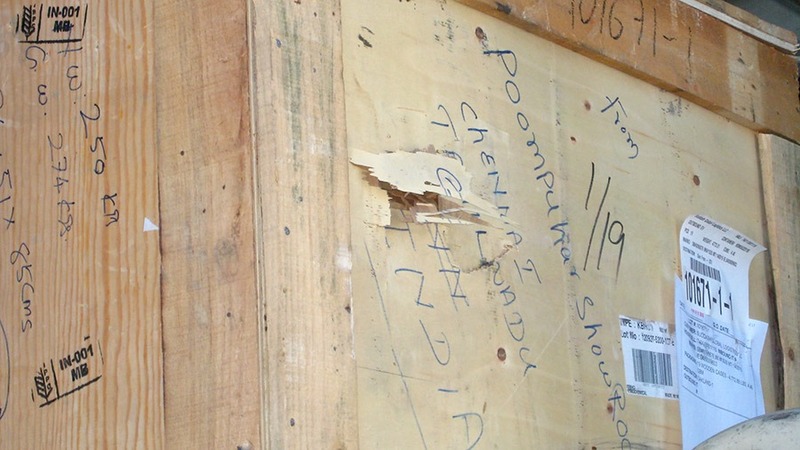 A damaged crate. We hope nothing is broken inside!!! The transfer is complete. 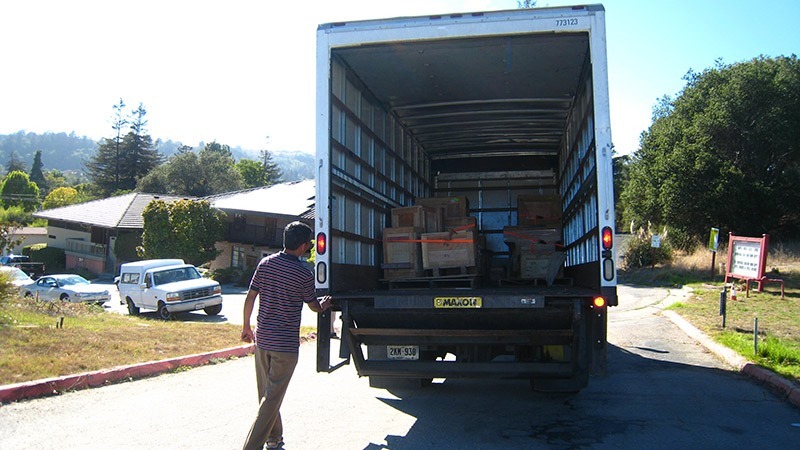 Scott and Raman use straps to secure all the crates before driving across the street and back into the SAT parking lot. 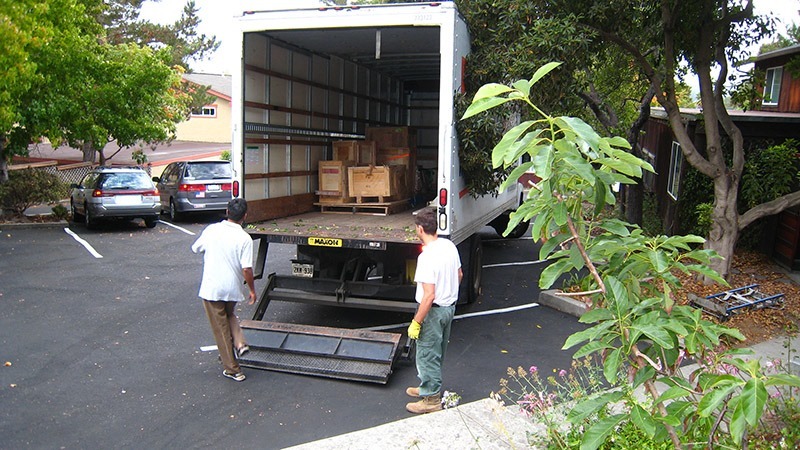 Raman walks behind the truck making sure the crates remain secure as Scott drives the truck. Safely arriving in the SAT Temple parking lot. 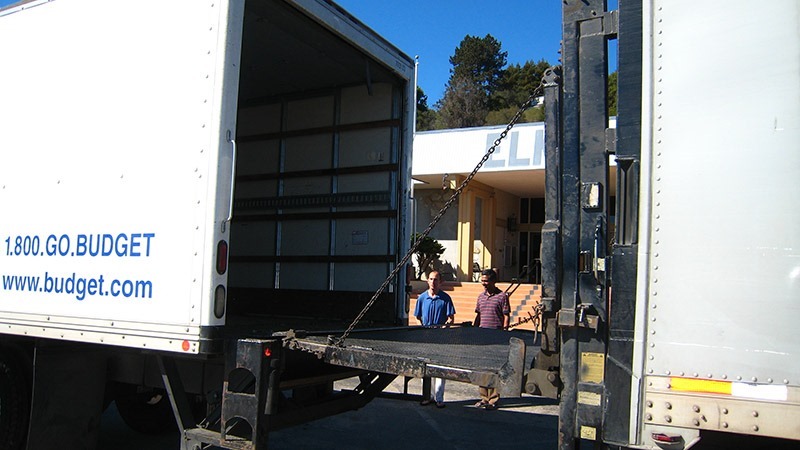 The Murti-s will remain secure in the truck until tomorrow when other devotees arrive to help unload and prepare for the crane. 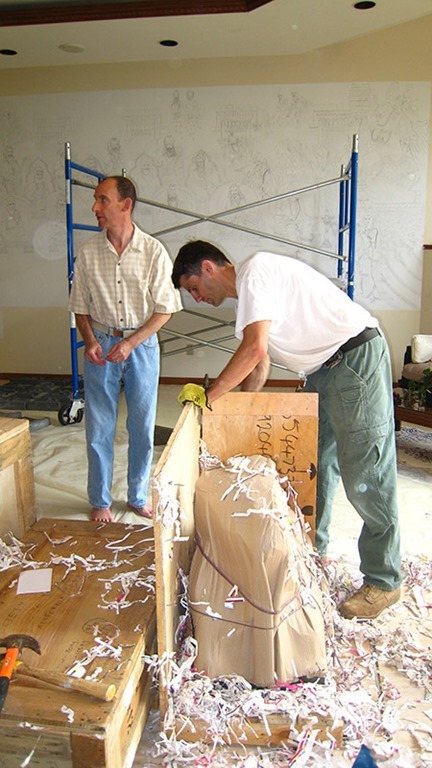 Raman and Scott arrive early the next day to prepare for the crane and the unloading begins. 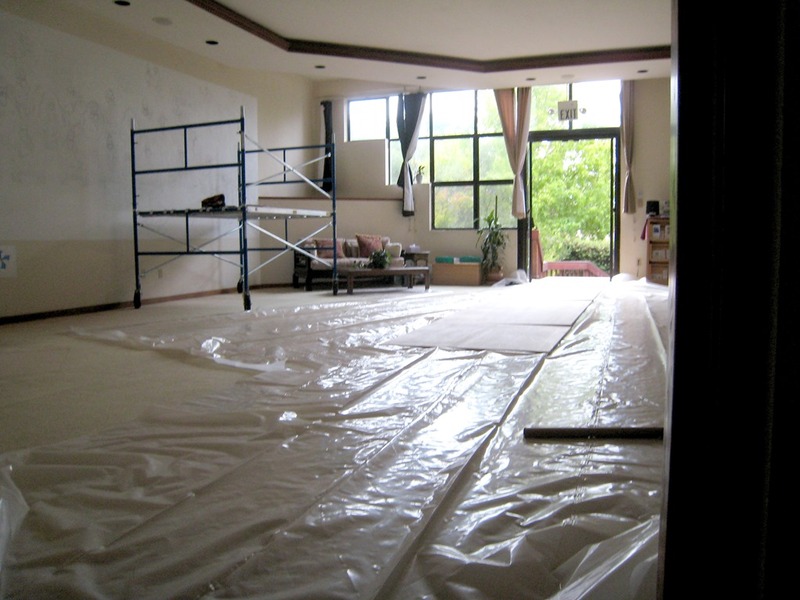 The Lotus Room is prepared for the Murti-s arrival into the Temple. 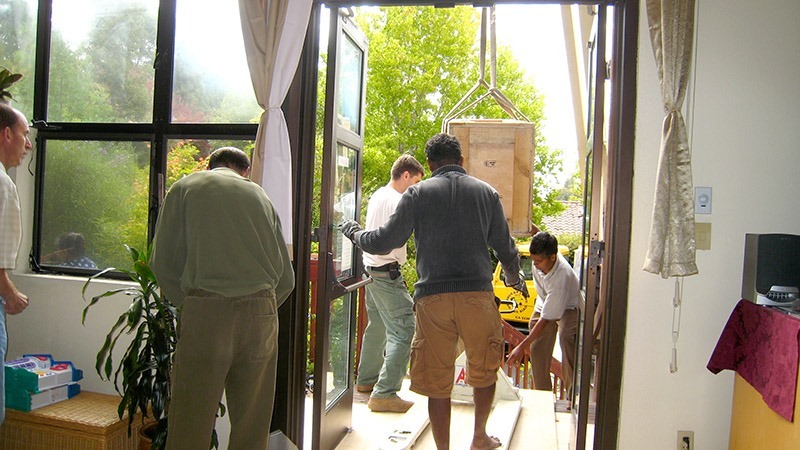 More devotees arrive and begin to carry into the Temple whatever does not require the crane. 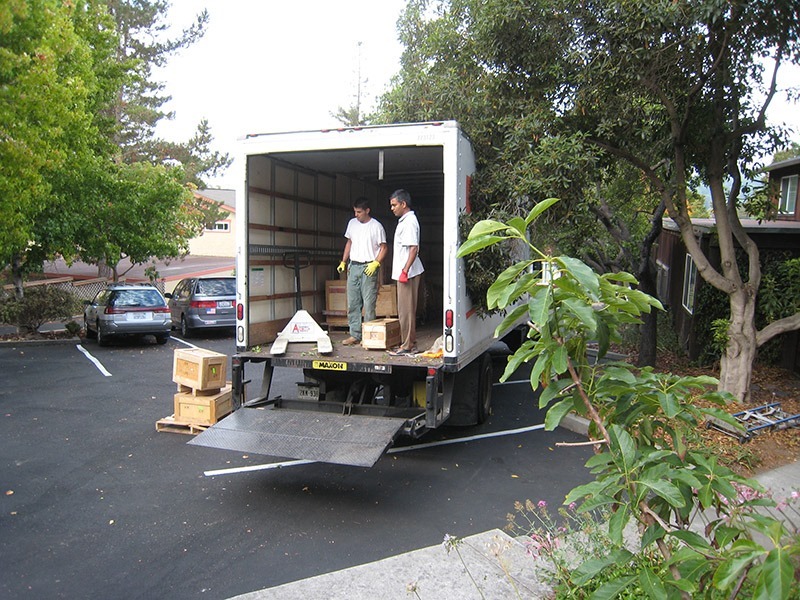 Crates are opened in the parking lot and the lighter weight contents are carried into the Temple. 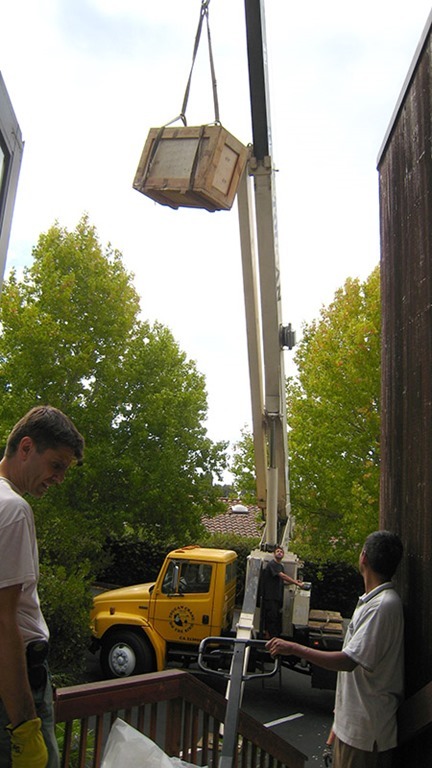 The heavy items are positioned so that the crane can have easy access to lift the crates on to the Lotus Room deck. 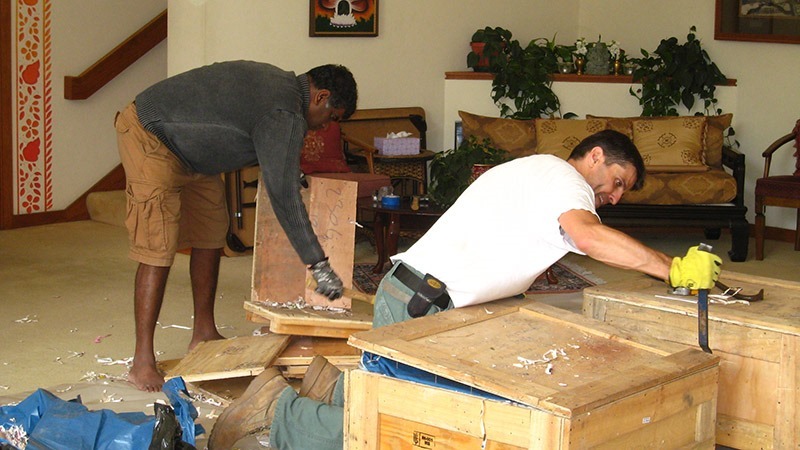 Janani helps Eric unpack crates. 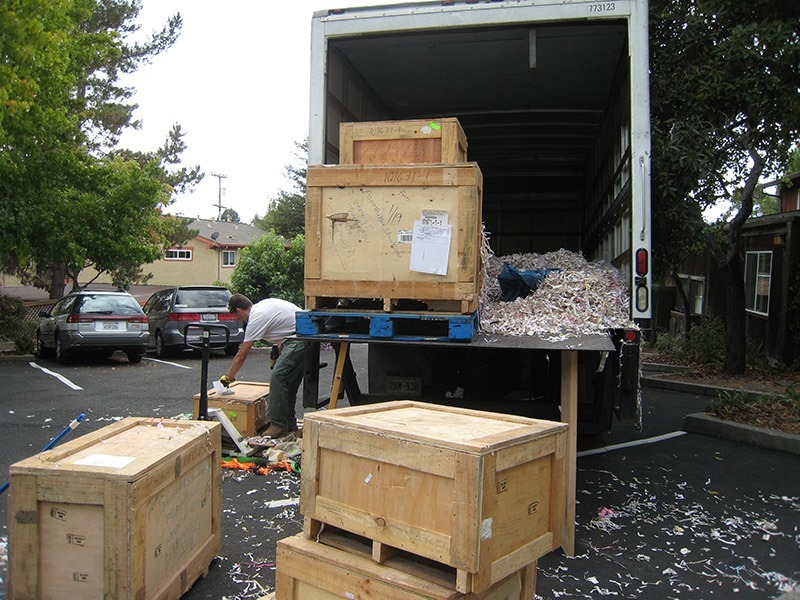 Eric opens crates full of stone tiles. Nome arrives and sees all the work that has been done. He and Sangeeta discuss washing the tiles. 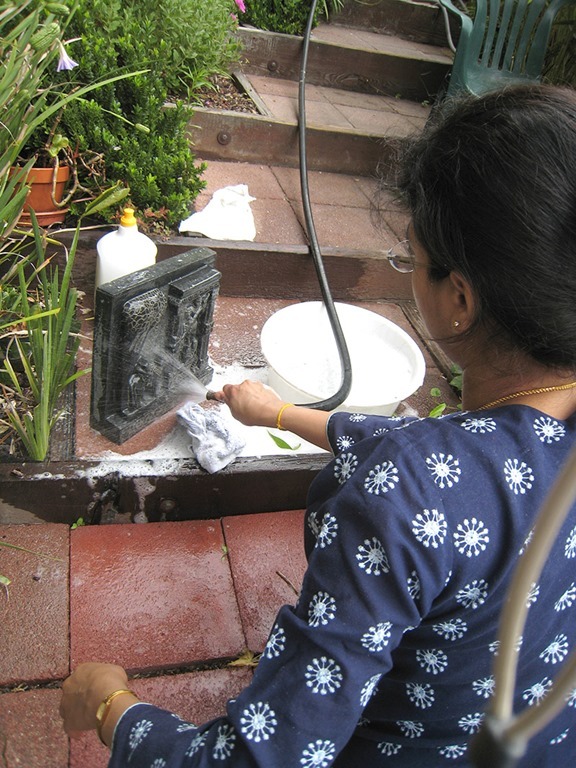 Sangeeta washes the tiles…they receive their first abhishekam! 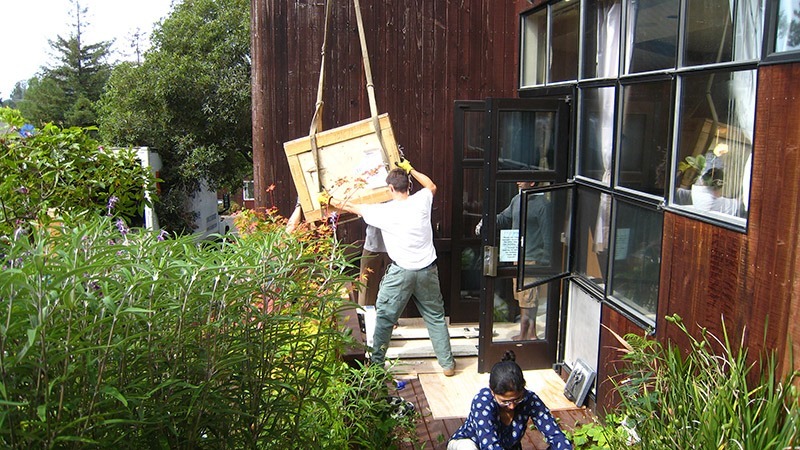 and hoisted into the air. 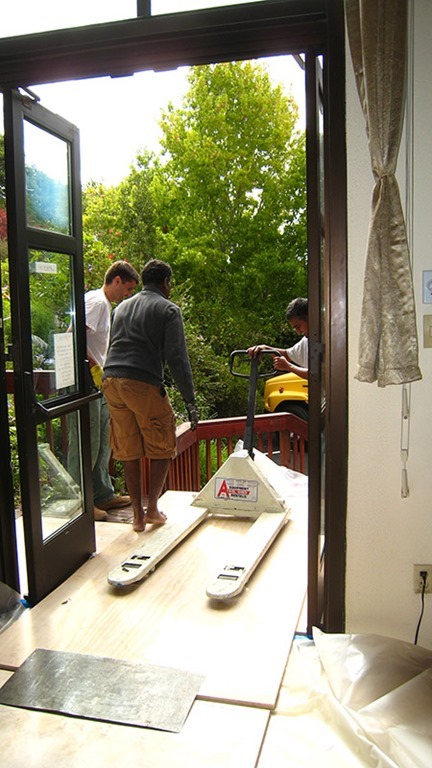 Raman, Siva, and Scott make sure the pallet jack is in place on the Lotus Room deck where the crate will be lowered. 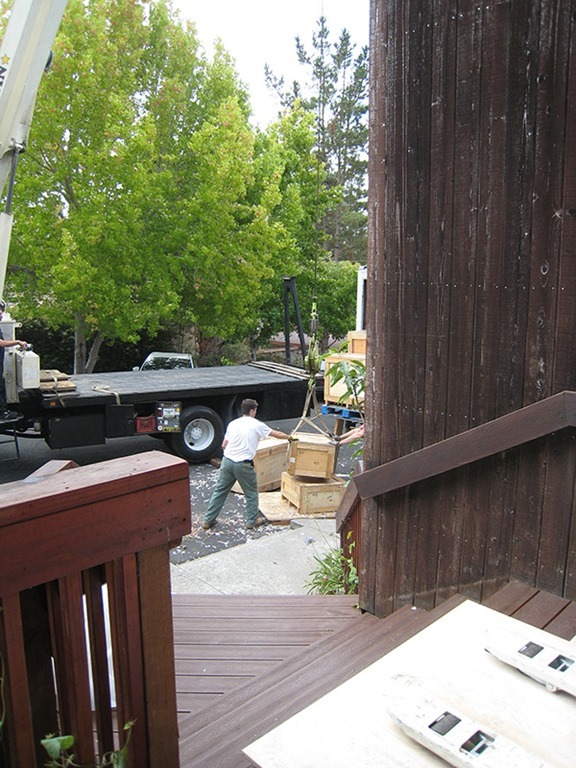 Easy does it…down, down, slowly comes the crate. 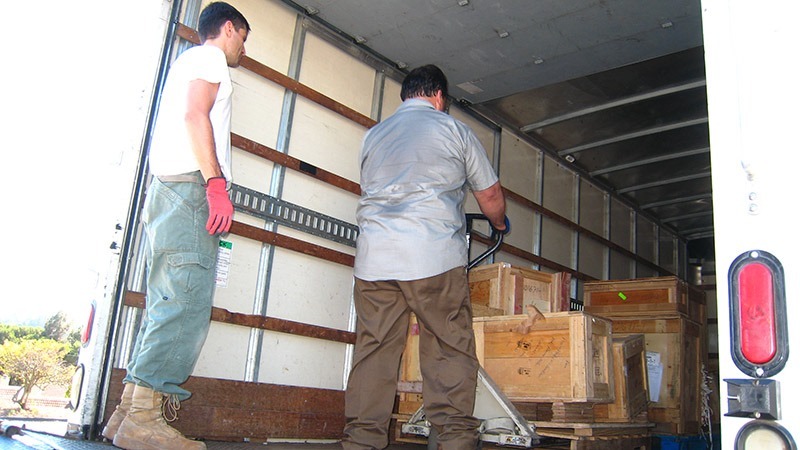 Each crate is brought inside and taken off the pallet jack. 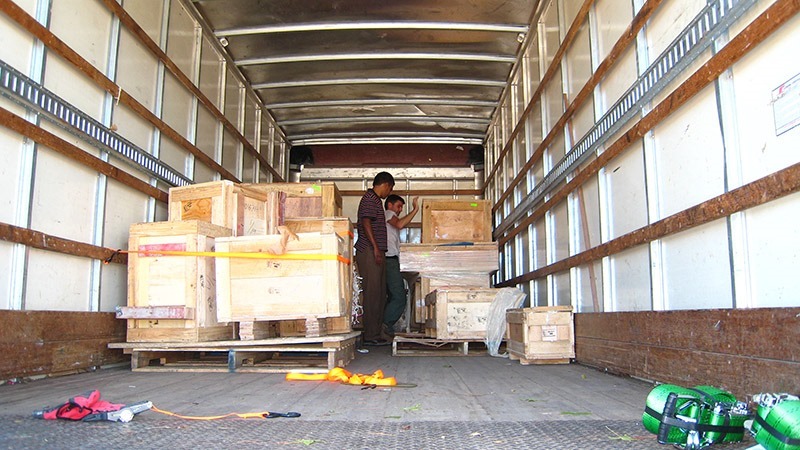 Nome looks at the opened crates. 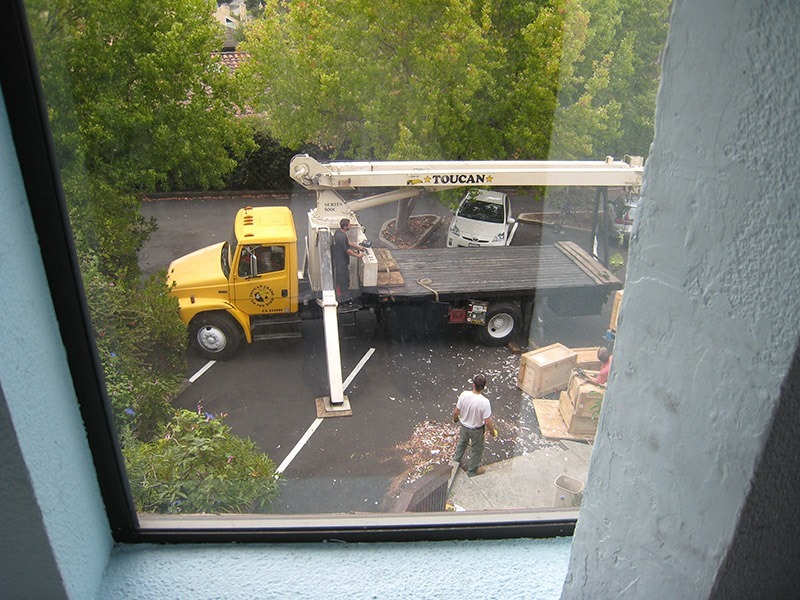 All the crates have been opened now and the debris has been removed. 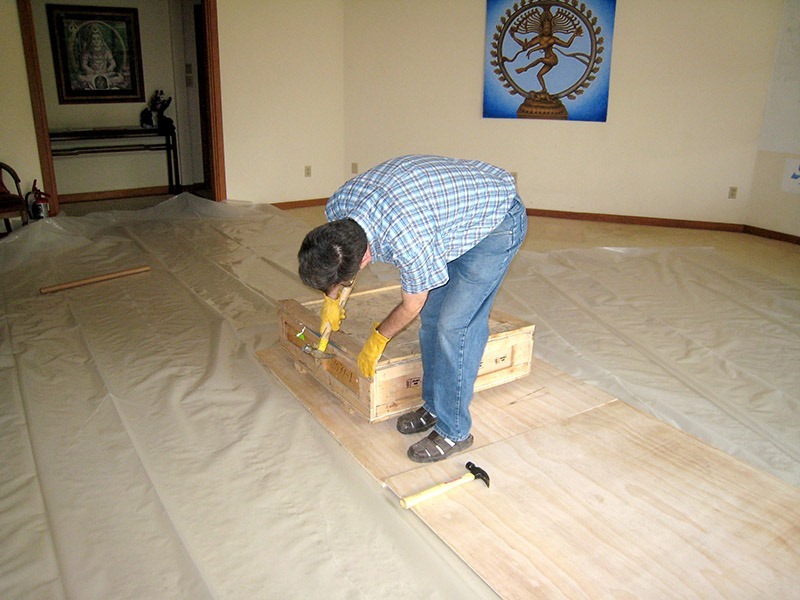 Now it is time to set up a temporary altar for the Murti-s in the Lotus Room until the Sri Sadisvara Mandiram is built. First, everything is washed. 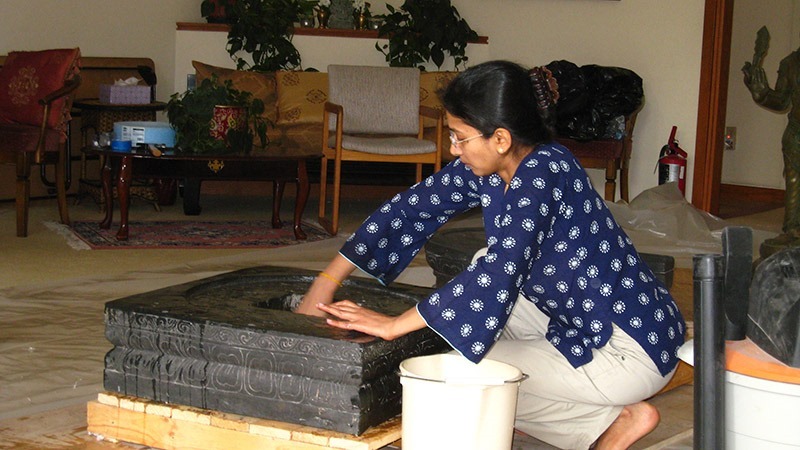 Below, Sangeeta washes the base to the Lingam. Then, the base is positioned for the temporary altar. 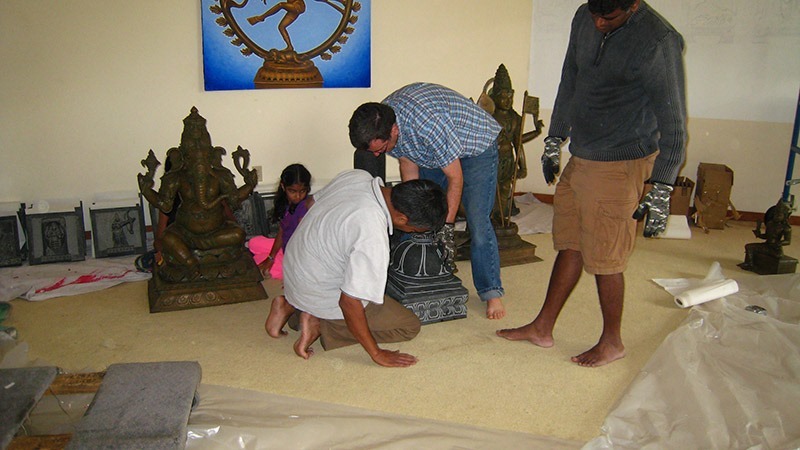 Next, the Lingam is placed upon the base. The heaviest part is the Yoni. The hole goes all the way through and the Lingam must pass through it. 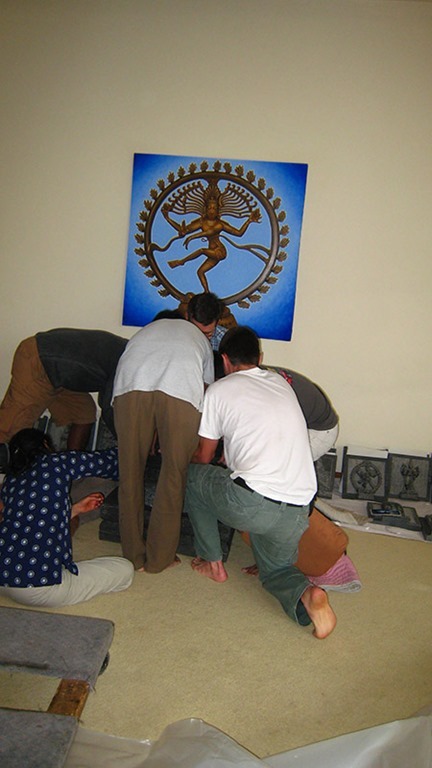 Siva, Raman, Eric and Jnana discuss the best way to lift it on to the Lingam. 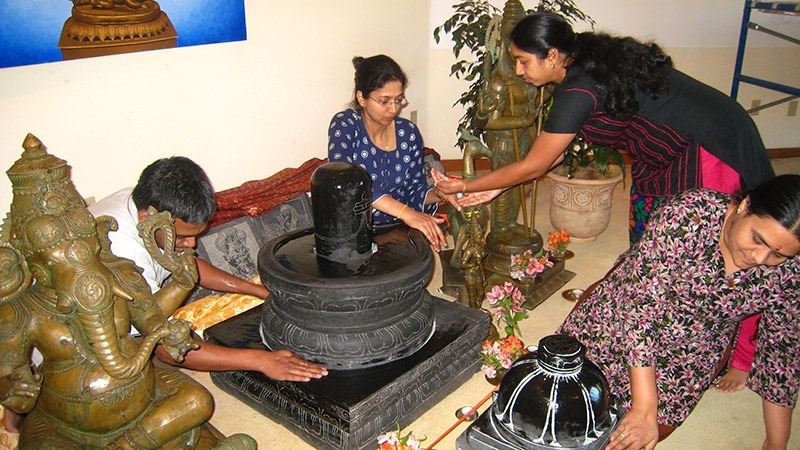 They use all their strength to lift it up and upon the Lingam as Sangeeta guides them while it is lowered. 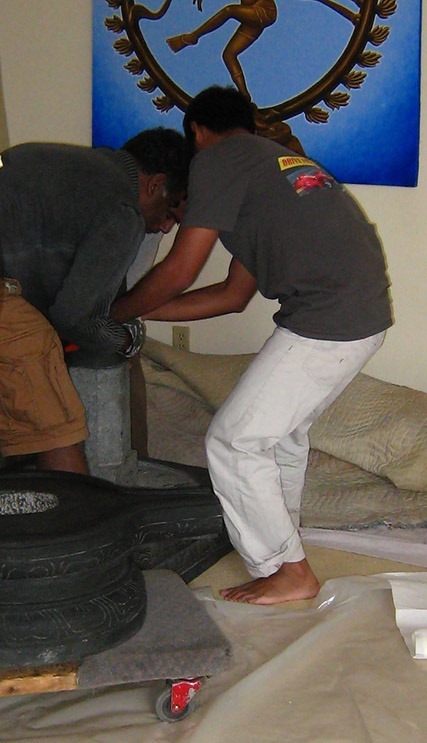 Cushions are used to protect the base while the Yoni is lowered. The Lingam is in place. 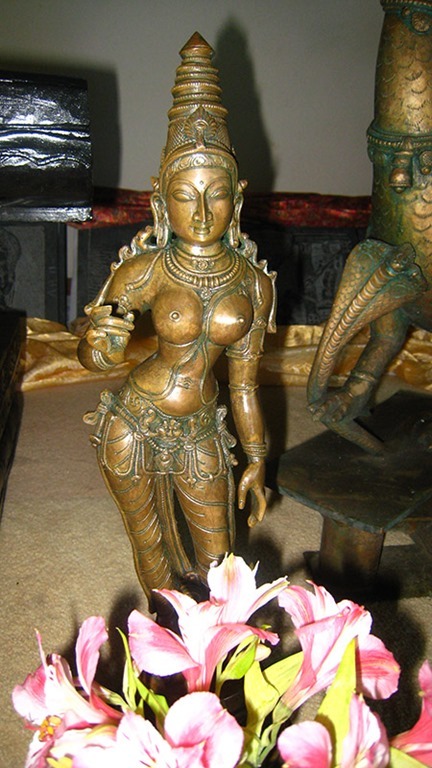 Next Skanda is placed next to the Lingam. 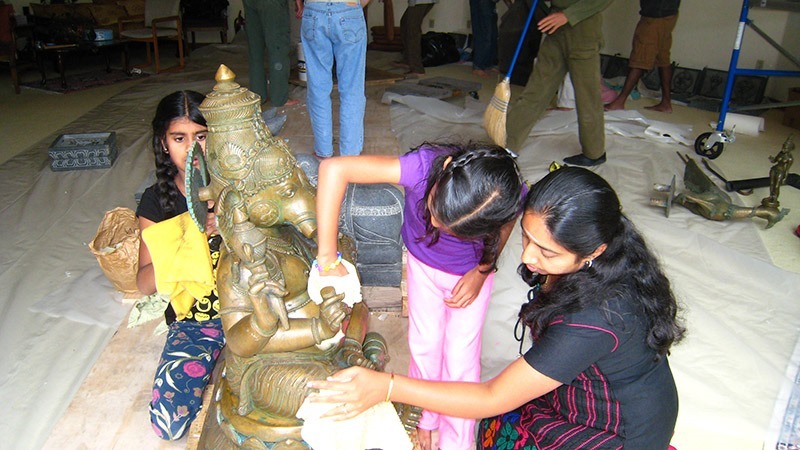 Janani, Sruti and Jaya wash Ganesha preparing Him to be moved into position. 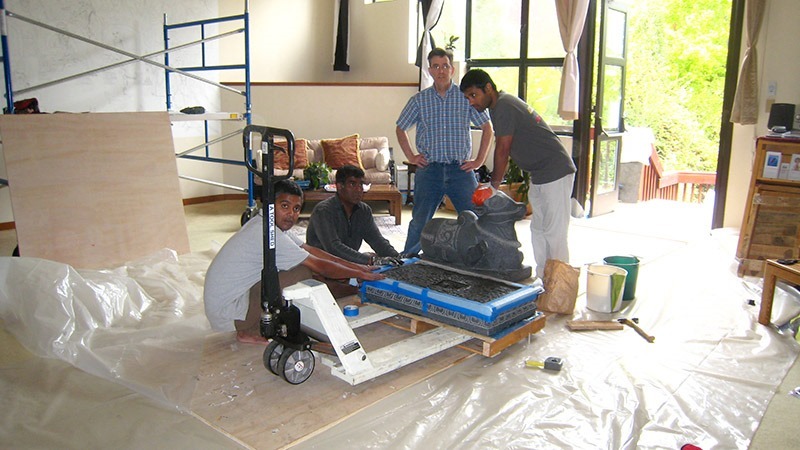 Ganesha is lifted onto the rolling cart. Then He is placed on the other side of the Siva Lingam. Ganesha is in place now. 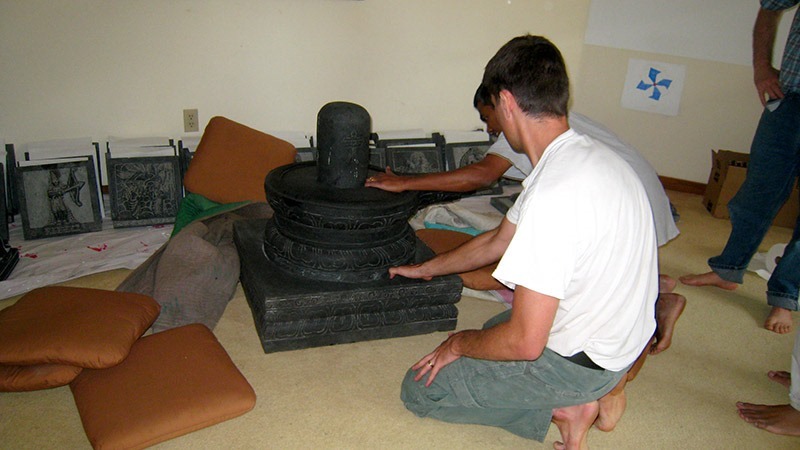 Next, the balipitam is placed in front of the Lingam. 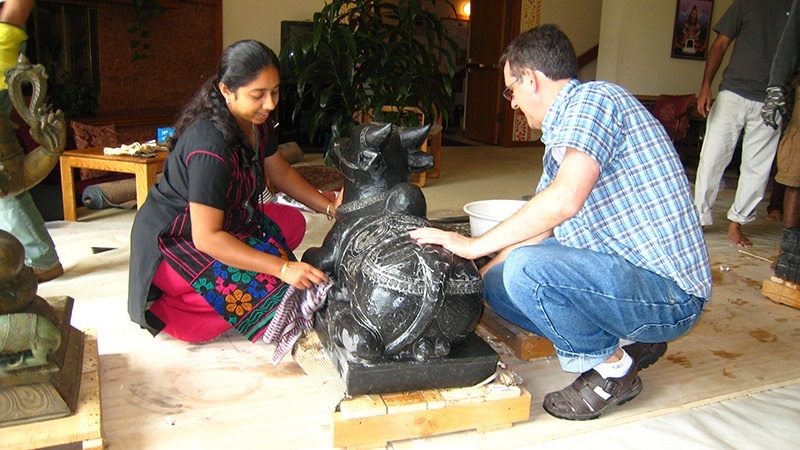 Jaya and Eric wash Nandi preparing Him to be moved in front of the Lingam. First His base is moved. 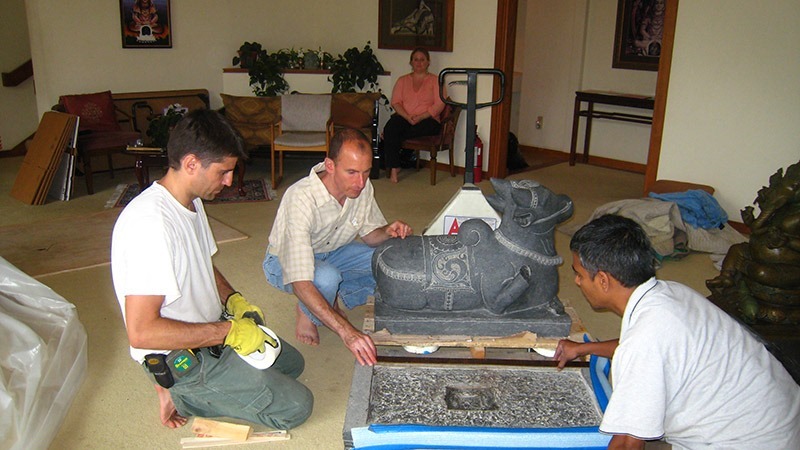 It must be covered with protective material so as not to chip the base when placing Nandi upon it. Nandi weighs 500 pounds! Next, Nandi is positioned next to His base. 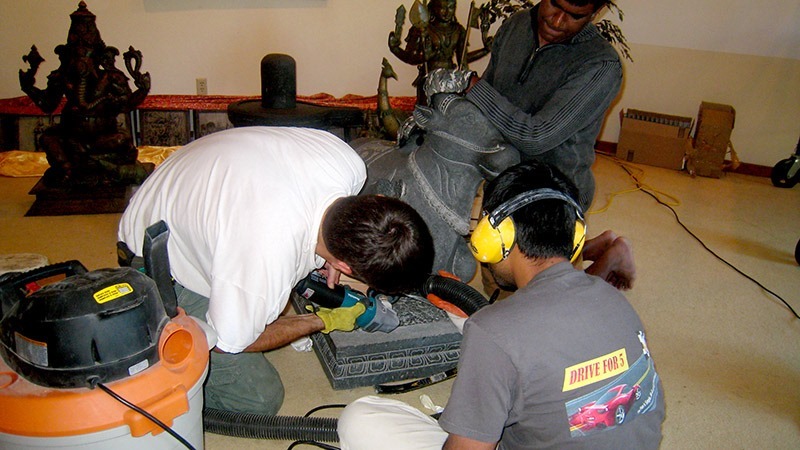 Nome discusses with Scott and Raman the best method to employ to get Nandi onto His base without damaging either one. 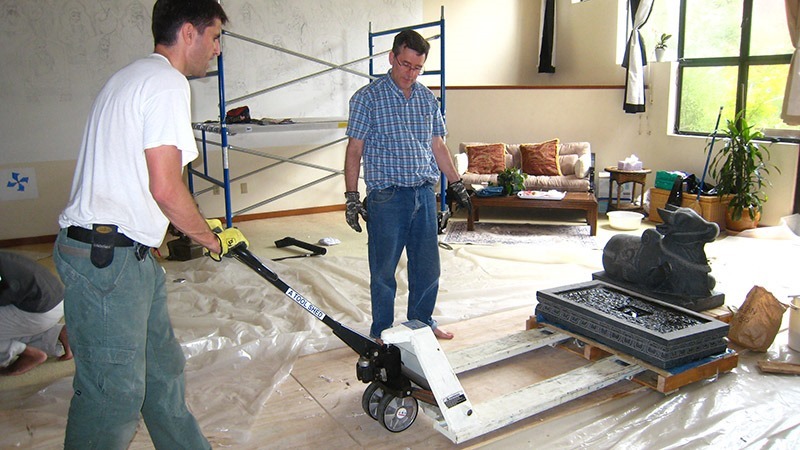 Crow bars are used to lift Nandi off of the dolly and onto the base. 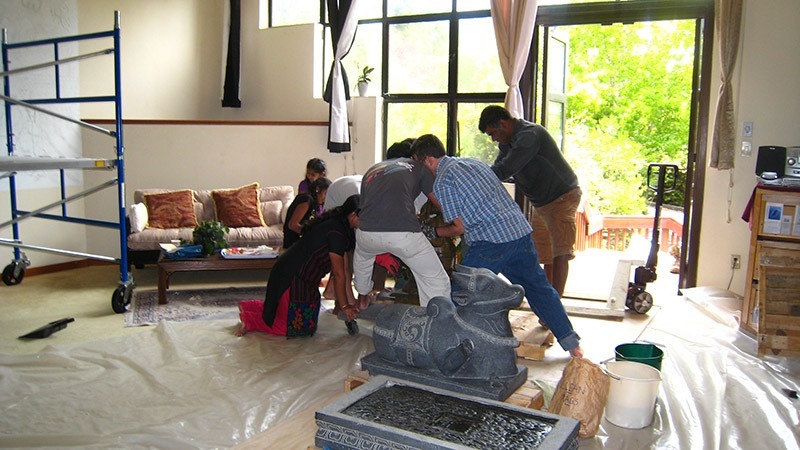 Everyone uses all their strength to move Nandi onto the base. Hmm. Nandi does not fit on the base properly. A little grinding will need to be done. 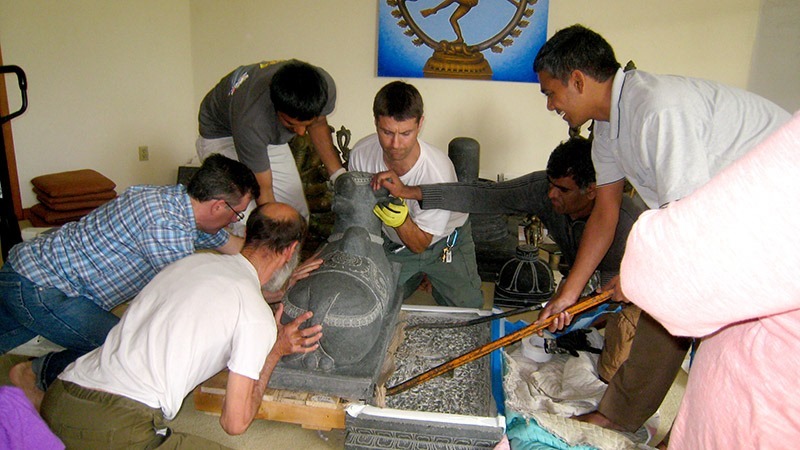 Siva holds Nandi on His side while Scott grinds a little stone away. 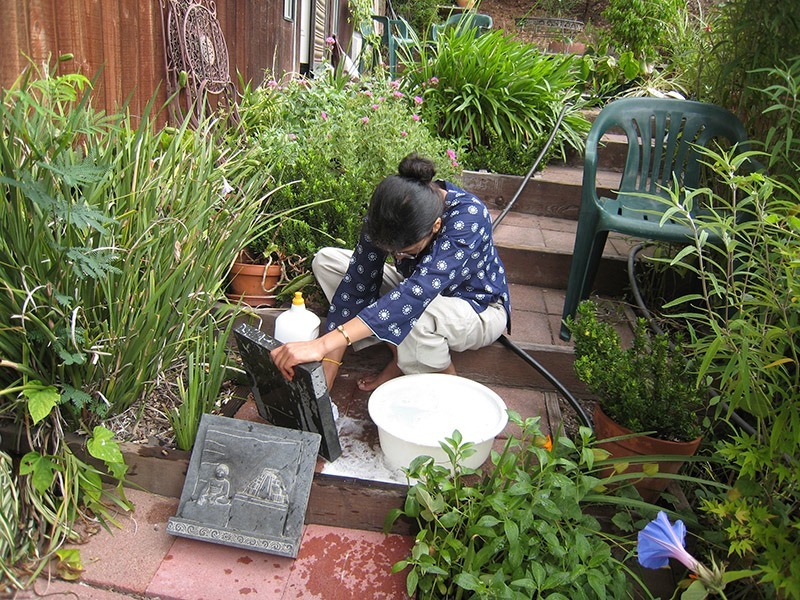 Jnana vacuums the stone dust as grinding is occurring. 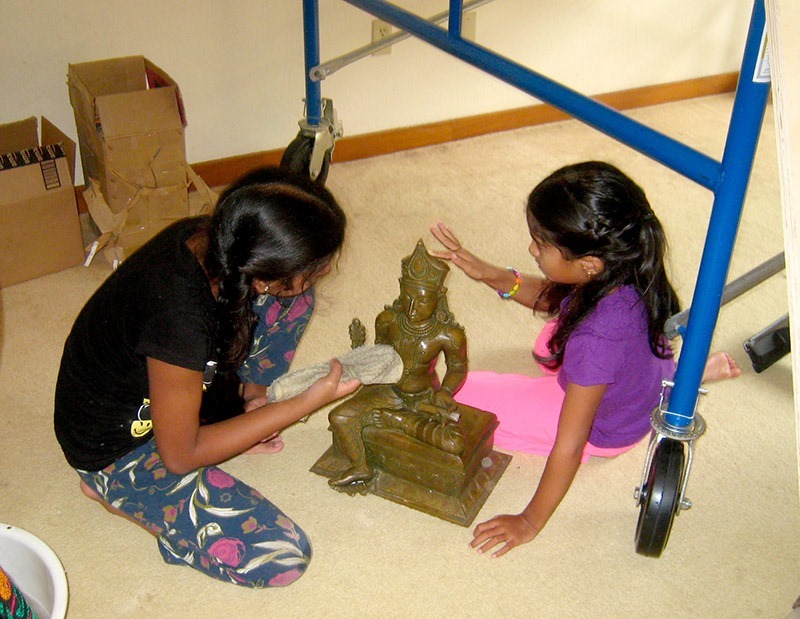 Meanwhile, Janani and Sruti clean Chitragupta and he is placed next to Ganesha. 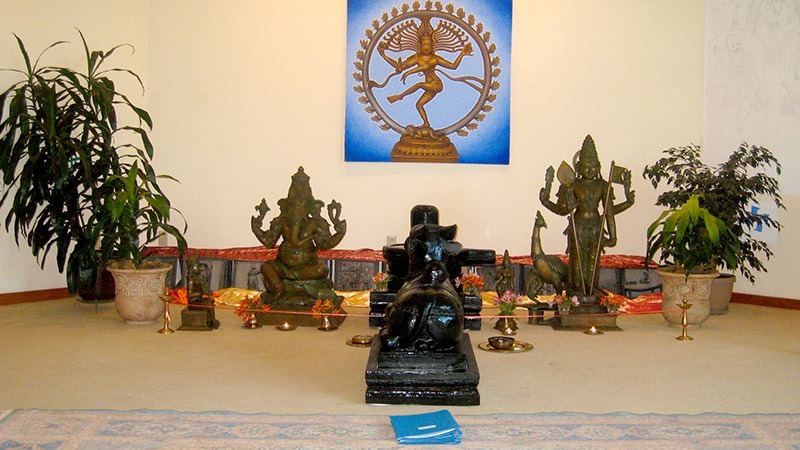 Sivakami is also washed and placed next to Siva Lingam. 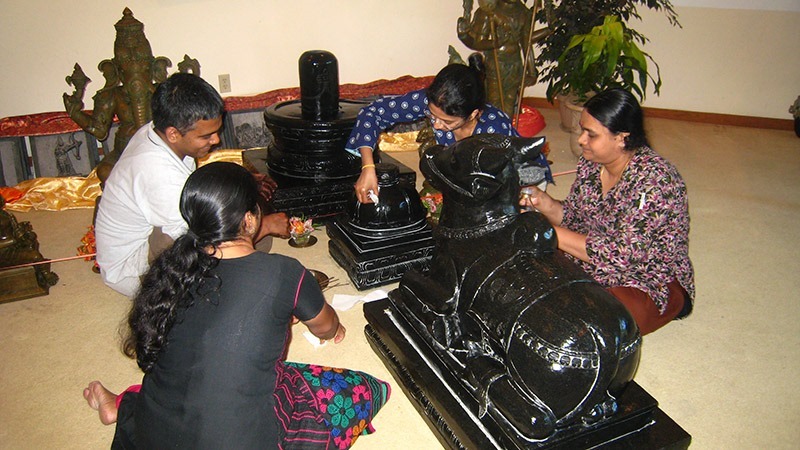 Raman, Sangeeta, Jaya and Anandhi apply oil to the Siva Lingam and the balipitam. Devotees meditate in front of the altar. 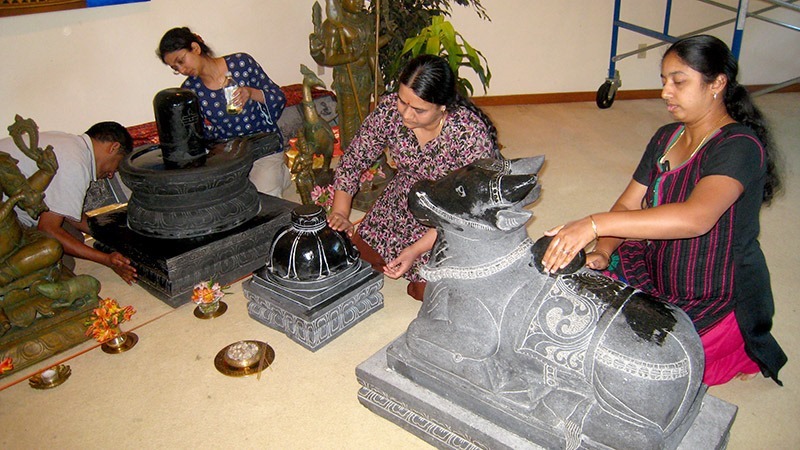 It is a very Holy ambiance The Murti-s, Siva Lingam and Nandi will remain in the Lotus Room temporarily until their permanent home in the Sri Sadisvara Mandiram is built. 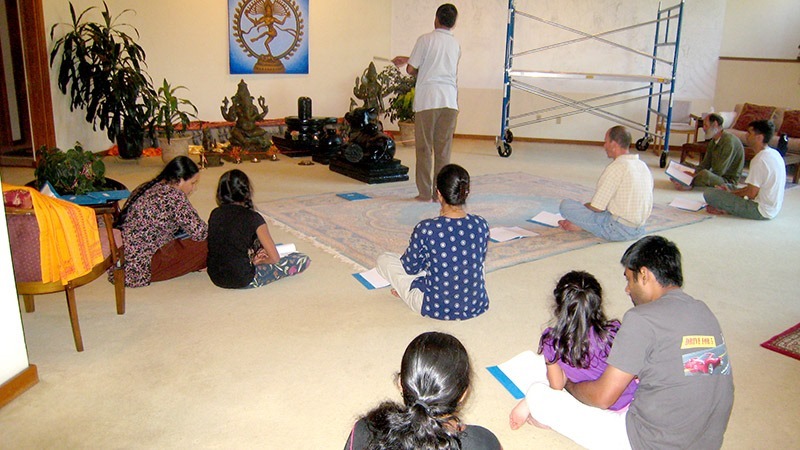 Devotees recited namavali to each Murti to welcome them to the SAT Temple. Blessing upon blessing Lord Siva has bestowed upon us! We are abundantly blessed by His Grace again and again. Prostrations, prostrations, prostrations to Lord Siva and Bhagavan Ramana. The Murti-s arrival completes Phase I of the Sri Sadisvara Mandiram. Engineering plans are now being created for Phase II. Phase II will consist of engineering the actual structure of the Mandiram, building up the floor where the deities will reside, laying floor tiles, and building and positioning the wood framed pillars. Estimated projected cost for this Phase is $60,000-$80,000. Phase III will consist of adhering tiles, including the stone tiles shown above, to the walls and the pillars, creating the arched embellishments in the ceiling, and creating stone altars for the deities. 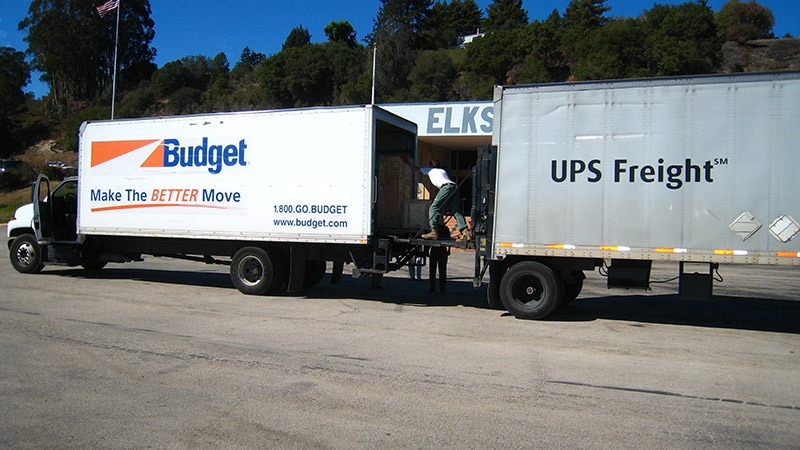 Estimated projected cost for this phase is between $40,000-$50,000. 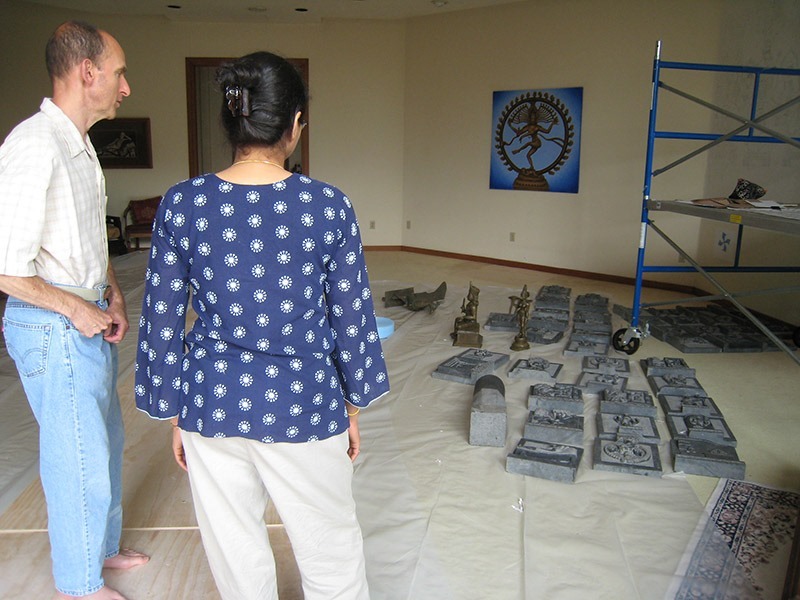 To complete our lineage, the procurement of bronze statues of Sri Sankara and Sri Ribhu, which will be placed in the Satsang hall, will be the final phase. Thank you to all devotees who have generously donated to this holy project. If you would like to donate toward this project, please contact SAT. 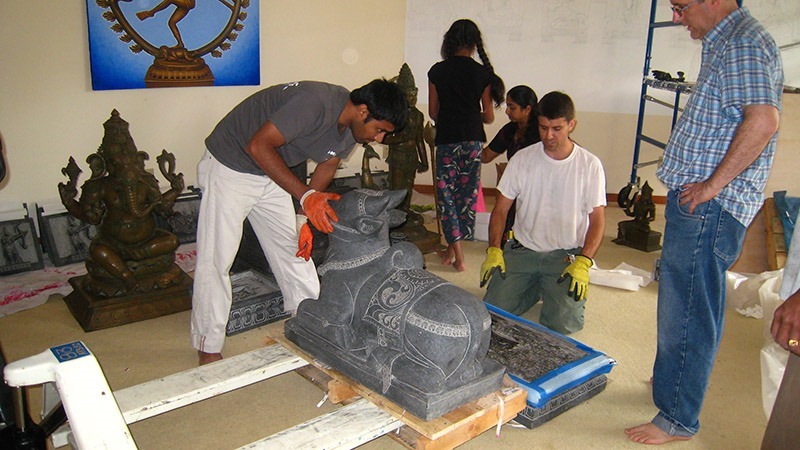 Please visit the SAT website at: http://www.satramana.org to find out more about this project and the SAT Temple. Wonderful to see this! Om Namah Sivaya! Om Bagavati Sri Ramanaya.